Oxalis pes-caprae L. (common names: Bermuda buttercup, soursob, sour grass, African woodsorrel,) is an attractive plant with bright yellow flowers. The petioles are usually less than 12 cm long, with trifoliate leaves with clover-like heart-shaped leaflets, sometimes with brown or purple spots on top. The showy flowers of O. pes-caprae are arranged in umbel-like inflorescences. These inflorescences generally have 10 to 20 flowers each, on peduncles 10 to 30 cm in height. The 5 sepals are lanceolate in shape. The 5 yellow petals are clawed and 2 to 2.5 cm in length, 10 anthers and an ovary – seems pretty normal, right? Wrong! There is something very wrong with these flowers and that might be very lucky. Perhaps you lost me now, so I better explain what I mean. Please, come a little bit closer and have a look at the wonderful details of this attractive plant. 1: whole plant, including stem and roots with bulbils; 2: leaf; 3: inflorescence, flowers; 4: androgynophore: partly fused stamens, nectaries and ovary; 5: bundle of stamens, opened, outside view; 6: same from the inside; 7: ovary with 5 free styles (numbers 8 to 11 belong to O.debilis corymbosa and the numbers 12 to 25 belong to O.corniculata). Look again at the drawing at the detail with number 4: the anthers are situated at two different levels, every time one short anther, then one long, then a short anther again, and so on. And the styles on the ovary are at the lowest level – the third level. So, reasoning from the top downwards: long anthers, short anthers, styles. Three levels. This is called heterotristyly. 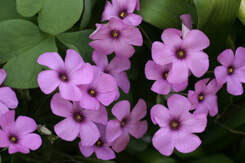 (You will also find this rarity in the next Oxalis: O. debilis var. corymbosa, in the drawing numbered 8 to 11). 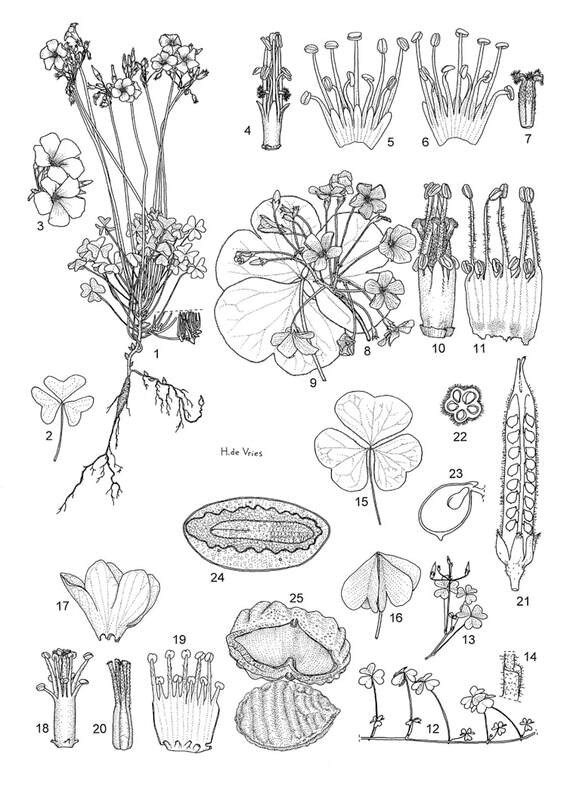 Now, plants with two levels (called heterodistyly) are not so strange (look at drawing number 18 belonging to O.corniculata), but three levels is rare (and occurs only in a few species in Lythraceae,Oxalidaceae,Linaceae and Conneraceae). Darwin publicized his theories on this subject in his book «The different forms of flowers on plants of the same species» (1877). 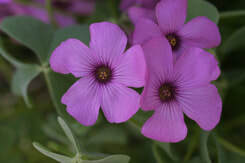 In two other Oxalis species (O.gracilis and O.exilis (both not in Greece) a profound study has been done for the consequences of heterotristyly. Now, where comes the lucky part? In the case of heterotristyly, there are three possibilities: long stamens + short stamens + styles (as in O.pes-caprae), long stamens + styles + short stamens (as in O.debilis var.corymbosa, look at the drawing at detail number 10), and styles + long stamens + short stamens. I’ll call them type A, type B and type C. Actually, I just borrowed this expression from Engler & Prantl in their Natürlichen Pflantzenfamilien where he writes (Oxalidaceae, page 17): “Vollständige Unfruchtbarkeit bei Vereinigung von Bl. gleigher Art (langgrifflich mit langgrifflich etc) hat sich .... ergeben”. (You’ll find complete sterility when crossing flowers of the same type). That means that crossing type A with type B or type C produces fertile fruits, but crossing type A with type A never gives fruits and seeds. In its native country South Africa all three flower types exist resulting in fruit and seed set. In other countries it has never been seen to set a single fruit or seed. Why is that so lucky? Around 1806 the curator of the botanical garden of Malta brought O.pes-caprae from its native country, the Cape Region of South Africa, to Malta. In a few years it was found outside the garden, and in the following years it spread. To Italy, Greece, the whole Mediterranean, via the Middle East (probably around 1906 it arrived in Israel) and India it reached Australia, and in the other direction, Northern Africa and from Portugal to the Southern parts of England and the United States and Central America and further down. Especially in southern Australia, California and South America it is a noxious weed. Fortunately, the curator of the botanical garden in Malta had only one plant with an uneven chromosome-number (2n=5x=35) and these types are usually sterile or at least less fertile. And fortunately, the curator in Malta had only one type from the three types, the type with long stamens + short stamens + styles, type A, which implies illegitimate pollination only. So, you will never find fruits and seeds, and still, Oxalis pes-caprae managed to become a serious weed in many countries. How? Although O.pes-caprae does not produce fruits and seeds, it makes little bulbils (bulblets) on the lower part of the stem and on the roots. So it only spreads if someone moves or removes the plant or the ground where it grows!!! And then it spreads like a plague. In some parts of Florida it is an «alien-invasive pest»,an aggressive colonizer weed, ‘nearing out-of-control status’. And I quote some reports: The Humboldt Bay National Wildlife Refuge in northern California reports that O. pes-caprae within the past two years, started to spread explosively. She has observed O. pes-caprae in Humboldt County for at least five years, but that it was only present as an occasional garden weed. However, populations of O. pes-caprae exploded in 2000, when BLM executed a large annual grass removal project in their endangered plant area using heavy equipment. Apparently, soils were disturbed and soil contaminated with O. pes-caprae bulblets were introduced at that time, and flowered the following year. In the following year, 2001, BLM attempted to hand-remove the bulblets, but a greater abundance appeared in 2002. It is not difficult to kill O. pes-caprae using herbicide and a 95% kill rate can be achieved, but new plants are able to germinate from bulblets and mature so rapidly, that within a few days or weeks, new plants are flowering and control treatments must be done again. In a ‘Red Alert” I found the following remark: Don't let this pretty little garden pest get into your natural area...it will rapidly create hundreds of tiny bulblets that are nearly impossible to eradicate! From Australia is reported: O. pes-caprae was introduced as a garden ornamental. Associated with Mediterranean climates, it also occurs in sub-tropical and semi-arid regions and is now present in all Australian states and territories. I nearly forgot: it may cause oxalate poisoning in livestock if eaten in large quantities. Can you imagine if it would also spread from seeds!!! At the other hand, let us not forget that someone introduced it to Malta, and that humans have spread it all over the globe. And let us not forget that it still is a fascinating plant. There is so much more to be said about O.pes-caprae. Please return to the drawing, to detail number 4. The 10 stamens occur in 2 cycles of 5 , the outermost are the shorter and these are opposite to the petals, the long stamens are in front of the sepals. On the base of the partially fused stamens are remnants of a nectary disc, represented only by 5 extrastaminal glands or nectaries, alternating with the petals. This species is not very cold-hardy, though it is naturalized in parts of south-western England but it does not flower there. It tolerates temperatures down to about -5°c. There is another strange thing about this plant : in the Proceedings Biological Sciences, Volume 271, Biology Letters Supplement 4 / May 07, 2004, Rottenberg & Parker wrote an article called: “Asexual populations of the invasive weed Oxalis pes-caprae are genetically variable” and noticed that despite the complete lack of sexual reproduction by fruits and seeds and the total dependency on vegetative dispersal by bulbets, populations were found with considerable genetic diversity within and between all of the populations tested. You can regularly find plants with double flowers (f.pleniflora). They speculated that this diversity could be the result of an accumulation of mutations or genome rearrangement. In Malta, where it is now the most common weed, a small parasitic plant (Orobanche muteli f.melitensis) changed host (some Leguminosae) and lives now exclusively on the roots of O.pes-caprae. The genus name Oxalis is derived from the Greek meaning sour, referring to the sour-tasting oxalic acid present throughout the plant. The species epithet pes-caprae means goat's foot, perhaps referring to the cloverleaf shape of the leaves. Bermuda buttercup is the common name most frequently used in the US. and Europe, and refers to its yellow-flowered appearance and likeness to the buttercup family. Soursob is the common name most frequently used for O. pes-caprae in Australia, and refers to its sour taste. In some publications it is often still represented under the old name O.corymbosa DC. Crete. And again, there is only one type, that is type B (long stamens + styles + short stamens). It also produces bulbets but it is not an aggressive invader as O.pes-caprae is. O.debilis corymbosa is a pubescent perennial with a quite large, up to 5 cm, subterranean bulb, which in turn produces several small white bulbils of 3 to 10 mm. The plant gives a somewhat slacky rosette, with the mostly 4 to 5 cm large leaves on 25 to 30 cm long petioles. The margin of the trifoliate, clover-like heart-shaped, more rounded leaflets is bordered with hairs. There is something strange with these leaves: in my garden in the Netherlands, leaves come out in December or January, but they don’t seem to suffer from the (occasionally) freezing winter cold. A few years ago they passed a week with temperatures of – 25 degrees without any damage. The Arum italicus looks terrible when frozen but when temperatures rise, they simply “defrost”. But this Oxalis does not seem to freeze!!! And then in April and May they start to flower with a ring of flowers of 70 cm in diameter. One day in the first week of May after a long warm spring I counted 167 nearly 3 cm large flowers. It’s an amazing view. Common Names: Common woodsorrel; Creeping woodsorrel; Procumbent Yellow-sorrel; Sleeping Beauty; Yellow Wood Sorrel (Australia). In the drawing: numbers 12 to 25 correspond with O.corniculata. Oxalis corniculata L. is a cosmopolitan weed species that occurs throughout the world. 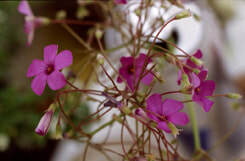 It is widely distributed in flower beds, nurseries, gardens, and greenhouses. In the greenhouse or as a weed in the pots of indoor plants, it is a perennial plant and lives for several seasons. The yellow flowers which are approximately 6 mm in diameter have five petals and number 2-6 per stem. It is a somewhat delicate-appearing, low-growing, herbaceous plant, creeping and forming roots along its stems where nodes contact the soil. These stems are sometime more then 50 cm long. If the plant is pulled out, the rootstock often breaks off and remains in the soil, allowing the plant to regrow. The leaves of creeping woodsorrel are alternate and composed of three rounded heart-shaped leaflets that resemble a clover and that are attached to the tip of a 4 to 8 cm long stem, the petiole. Leaves can range in color from green to purple and red-brown. Unlike the other two species, it does not produce bulbs. And unlike the other two species, it has stipules. Very very small auriculate stipules. So small, that you’ll need a magnifier or a microscope (look at detail 14 of the drawing). And unlike the other two species, it produces fruits and seeds. Finally, I want to ask your attention for a funny aspect of the leaves. Sometimes the plant is called Sleeping Beauty because in the evening (or when it gets too dark during the day) the plant folds its leaves. This is called Sleeping Movement, please take a look at details 15 and 16 in the drawing. Already in 325/324 B.C. the plant sleep was described by Theophrast, Plinius the Elder and Androsthenes (the admiral of Alexander the Great). In 1880 Darwin published a 600 pages book “The Power of Movement in Plants” where he investigated many different movements in plants, including sleep movement. In the more then hundred years after Darwin’s research, in some plants the process and the chemicals behind it have been identified. It turned out that only very small energy changes are sufficient to induce a series of physiological processes that are manifested as leaf movement. The active compounds of sleeping are factors that comprise of phytohormones. In two species, Acacia karroo and Mimosa pudica, the phytohormones and their structures have been identified (see: H.Schildknecht & K.Schumacher). They called these Plant Movement Factors Nyctinastenes with the names K-PLMF1 and so on. Plant sleep movement can be found in Albizia julibrissin, Robinia pseudoacacia, several Oxalis species (including O.pes-caprae and O.debilis), several Acacia species, Mimosa pudica, Abutilon grandiflorum and several others. Gustav Hegi:Illustrierte Flora von Mitteleuropa,IV-3,pages 1644-56. Lemmens,RHMJ.1989.Heterostyly.In:Breteler,F.J.,ed.The Conneraceae-a taxonomic study.Agricultural University Wageningen Papers 89-6:56-76. Matthews,M.L.en Endress,P.K. :Comparative floral structure and systematics in Oxalidales;Bot.Journal Linnean Soc:140-4,pages 321-381(2002). A.Rottenberg & J.S.Parker: Asexual populations of the invasive weed Oxalis pes-caprae are genetically variable; Proc.R.Soc.Lond.B(Suppl.) 271,S206-S208(2004). B.R.Trognitz & M.Hermann: Inheritance of tristyly in Oxalis tuberosa (Oxalidaceae); Heredity 86 (5),page 564-573(May 2001). Watson,L.,The Families of Flowering Plants: http://biodiversity.uno.edu/delta/angio/www/oxalidac.htm.